When returning from any big trip (you know, the kind that takes months of planning and several disappointed looks at your bank statement), I find it's often the smallest of activities that is the most meaningful. And when I think of Venice, of course I think of the canals and the gondolas and the labyrinth of streets that get you hopelessly (but romantically) lost. (Seriously, Venice is gorgeous. Enough cannot be said about that.) But these are never my first thoughts. My mind goes straight to the Rialto, one of the most heavily trafficked parts of an overly toured city. Tucked behind an unassuming storefront, directly across the street from the frenetic (and pungent) fish market is Pronto Pesce, a small fish shop selling local delicacies that were most likely swimming just a few hours prior to your purchase. I discovered this little gem on the Travel Channel's recently wrapped series, No Reservations. Knowing Anthony Bourdain would never steer me wrong, I knew that this had to be a stop on my own itinerary to Venice. And boy, did Mr. Bourdain ever find a prime spot! The display case, upon first glance, isn't really all that impressive – especially if you don't know what it is you're looking at. Fortunately, the people behind the counter speak English relatively well and are more than willing to explain what it is you see. Pronto Pesce opened in 2007 as a simple fish market with takeaway service, but since then has grown to become an eat-in establishment, as well. There are fewer than 20 seats in the entire store and through large glass windows diners can gaze out at the raucous action at the Rialto. The patrons that wander in and out are undeniably local – not a Nikon or a fanny pack in sight! If you are on a trip to Venice this is a perfect spot for a light lunch, an afternoon buzz and a peek into what Venice would be like without anyone but Venetians. 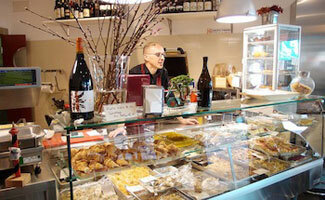 Pronto Pesce can be found at San Polo 319 in historic Venice. Traveler's tip: Because Venice is mostly occupied with tourists, I wouldn't recommend spending more than one or two days in the city. Hotel rooms and most restaurants are out-of-this-world expensive, and you are essentially visiting a giant outdoor museum. The city is a must-see, for sure, but Italy is home to towns that are just as picturesque and infinitely more authentic. Fortunately, Italy's extensive rail network makes a quick trip to Venice entirely possible. Visit Trenitalia for train fares and schedules. A high-speed train from Rome takes less than four hours, making Venice a great destination for a weekend jaunt. 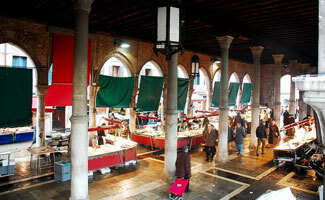 Got any hidden local hotspots in Venice to share? Tell us about them below!